Editor's Note: Wednesday’s American Morning audience was most intrigued by the question of “moral authority” in Carol Costello's "Mad as Hell" piece. Some praised Carol Costello for discussing “empathy.” Others reflected on those whom they trust as their moral compass, with many naming President Obama and spiritual leaders as their guides. Niki: To Carol Costello-Brava! Finally someone talked about it: EMPATHY. We are the "United" states. It’s about time we started caring about each other and not just the sound of our own voices and gripes. Cemali: The moral compass in this country is our new president. He calls a spade a spade, he does his best to inspire and encourage youth to be the best they can and he is a beacon of hope to 55% of us in a time when we feel like all hope is lost. Morally & financially. He doesn't only do that for Americans, he has also managed to do it for the entire world. It's about time! Mary: I think that President Obama is an extremely rational thinking person who has a very very hard and stressful job. I also think that he appears to be a very moral person,. We all have to "come together" and stop being so judgmental of everyone else (I am including all of our politicians too). I think we should believe that a stranger is just a friend we haven't met yet. My question of the day is: If you were president how would you handle yourself as president and what do you think the populace would think about your handling of the job? Doug: The moral authority in this country is our Church and spiritual leaders. The problem is, simply, many people don't have one. Roy: we better go back to the basic and that is our creator. and ask for him to forgive us. and to give us love in our hearts instead of hate. because he is love. Who is your “moral authority”? What do you believe has created the division that exists in America today? UNITED NATIONS (CNN) - President Obama made a forceful call Wednesday for a new era in global relations, urging the United Nations to move past old divisions and disputes to reassert itself as a leading force in confronting the most pressing issues of today. 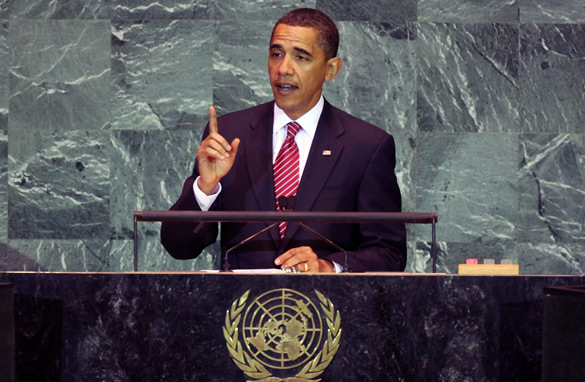 In his first speech as president to the U.N. General Assembly, Obama sought to distance his young administration from unilateral policies of his predecessor, while pledging a U.S. commitment to work with the United Nations in forging a better common future for all. "The United States stands ready to begin a new chapter of international cooperation - one that recognizes the rights and responsibilities of all nations," Obama said in concluding a speech that received strong applause. He told the assembly that the world's countries, both individually and collectively as the United Nations, have failed to put aside old ways of thinking and acting as they confront threats to global security and stability. (CNN) - Family members of one of the three hikers detained in Iran are heartened and hopeful over Iranian President Mahmoud Ahmadinejad's willingness to ask jurists to handle the case in a timely manner and weigh "maximum leniency" for their release. Josh Fattal's relatives say they haven't had contact with him since he was detained in Iran. 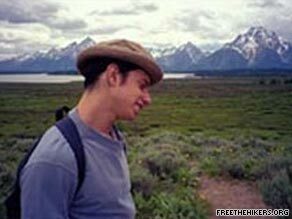 "We are encouraged by the recent statements of the president that he wants to deal with this matter expeditiously," said Alex Fattal, brother of hiker Josh Fattal. Alex Fattal, who spoke to CNN's "American Morning" on Wednesday with his mother Laura Fattal, said family members haven't had contact with Josh and "we take things day by day." Iranian authorities detained Josh Fattal, Shane Bauer and Sarah Shourd after they strayed into Iran in late July while hiking in a part of northern Iraq's Kurdish region. Ahmadinejad, who arrived in New York on Tuesday night for the U.N. General Assembly meeting, addressed the issue in an Associated Press television interview. He said the crossing of the Iranian border by "several American citizens" represented an "illegal entry," an act that is "considered a crime everywhere." "The judiciary handles these cases. The judiciary in Iran is completely independent, and no one can interfere with the process of the law and work of the judge." However, he said, "what I can ask is that the judiciary expedites the process and gives it its full attention ... and basically look at the case with maximum leniency." The mothers of the the hikers wrote Ahmadinejad a letter asking him to bring their children to New York with him. While that was not to be, Laura Fattal told CNN that "we're very, very encouraged by the compassion of President Ahmadinejad." They're a power couple, a partnership and about as A-list as you can get: President and First Lady Obama. So what makes their relationship tick? Author Christopher Andersen’s new book, "Barack and Michelle: Portrait of an American Marriage," gives a peek into some of the Obamas' most pivotal moments on their road to the White House. Andersen joined Kiran Chetry on CNN’s “American Morning” Wednesday. Below is an edited transcript of the interview. Chetry: It’s important to note, we reached out to the White House for a response to the book. They declined to comment but made it known they weren't happy. In fact, they pulled a previously scheduled interview we had with a senior adviser once they learned you were on the show. What’s your reaction to that? Christopher Andersen: About as senior as you can get, as I understand. I was dismayed because the USA Today story on the book said it was a glowing portrait of a rock-solid marriage and that is exactly what it is. It's a very positive look at what I think is a remarkable first family. Chetry: The other interesting thing is some questions that were brought up about sourcing, because at times in this book you do relay conversations where Michelle and Barack would be the only people in the room. So explain your sourcing. And explain how that works. Andersen: It's the fly on the wall technique, I suppose. What you do is you go to the people Michelle and Barack confided in: their friends in Chicago and his friends in Springfield, Illinois; his old poker playing buddies in the Senate that he talked to about these incidents. And they say precisely what they said to each other and what happened behind the scenes. And I do recreate that in the book. This is my 28th book. It is the fourth book I've written about presidential couples. The others were the Kennedys, the Clintons and the Bushes. And I have to say I think this is the most riveting of all those couples. It started as a cough. It wasn’t the kind of cough where something is temporarily stuck in your throat. It wasn’t the kind of cough where simply clearing your throat would’ve been adequate. 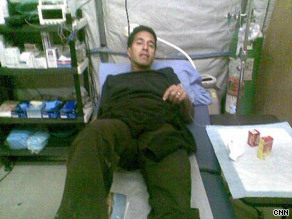 Dr. Sanjay Gupta, contracted H1N1 in Afghanistan, receives treatment. This was the kind of cough that hurts when you do it. A stinging pain that makes you wince and guard and hope that you don’t have to cough again any time soon. I thought I might have a fever, but of course, I was in the middle of covering a war in Afghanistan, and the conditions were… well, hot. So, maybe it was that. Problem was, the next day I wasn’t feeling any better – in fact, I was worse. I woke up in my dusty desert tent and tried to step out of my sleeping bag. Two steps later, I almost hit the deck. Incoming. Except this wasn’t due to any sirens going off, this was due to my own body simply being unable to hold myself up. I was lightheaded and freezing cold – even though it was over 100 degrees outside at that early hour of the morning. Program Note: Premiering Sunday, a new weekly series will get people talking. Join Christiane Amanpour for provocative analysis and global stories that matter to you. “Amanpour," Sunday 2 p.m. ET. NEW YORK (CNN) - President Obama spoke Wednesday at the U.N. General Assembly as he tackles a range of thorny international issues with his counterparts. Christiane Amanpour says the White House is confused about how to deal with Iran. Obama said Iran and North Korea "must be held accountable" if they continue to ignore international nuclear weapons treaties. Iran recently reiterated its unwillingness to give up its nuclear program, which the United States and other Western nations fear is being used to develop nuclear weapons. Iran insists its program is strictly for civilian power. U.S. Ambassador to the U.N. Susan Rice said she didn't expect a direct meeting between Obama and Iran’s president, Mahmoud Ahmadinejad, at the U.N. session. 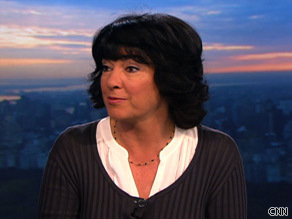 CNN Chief International Correspondent Christiane Amanpour says the White House is confused about how to deal with Iran. She joined Kiran Chetry and John Roberts on CNN’s “American Morning” Wednesday. Below is an edited transcript of the interview. Kiran Chetry: Ahmadinejad spoke to reporters late last night saying he's willing to push for leniency in the case of the three American hikers detained in his country, accused of entering illegally from Iraq. Chetry: Ahmadinejad is saying he would appeal to the court for maximum leniency. That's a pretty strong statement. Why is he coming out with that now? Christiane Amanpour: Well, it is. It's conciliatory and it reminds me of what he said about Roxana Saberi all those months ago. He won't come out and say, “I'm going to get them released” but he did back then and he has just now said he will tell the judiciary to act expeditiously and with leniency. So perhaps that will mean some movement on it, as it did with Roxana Saberi. And why is he doing it now? Because he's in the United States, obviously he's going to speak at the U.N., but beyond that, the U.S. government has decided to break with the Bush administration policy and now enter direct and bilateral talks with Iran, including being in the group of the P-5-plus-1 over the nuclear and other negotiations. So that's new. And I suppose he wants to pave some kind of different atmosphere. But it’s going to be difficult because of the tension still about that disputed election.